So I'm schlepping through Walmart minding my own business when I spot this forlorn little plant all by itself. It was in a decorative galvanized tin "pail" with about 2" of soil and 3" of standing water. Of course I grabbed it up! Now it's in a terra cotta pot with DRY cactus soil. Now I want to ID it. But I can't see an exact plant like it. 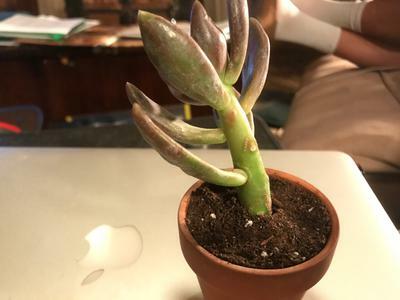 Maybe a graptopetalum, or echeveria? I need to name my little orphan! I'm pretty sure this is an x Pachyveria, a cross between Pachyphytum and Echeveria. They are variable between the two, and lots of times the leaves show a lot of interesting watermarks, which are from the Pachyphytum side, and the rosette type growth from the Echeveria. In fact, it looks a lot like this one, or something similar. More on x Pachyveria here. 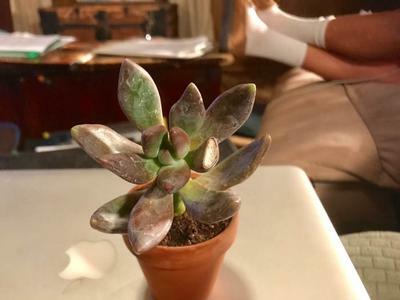 My plant has less purple color and is more "stemmy" but I bet that's because it hasn't had any decent light. If the rescue is successful, I'll post a follow-up photo in a few months. Thanks!